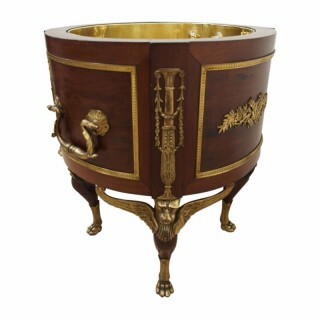 Circa 1900, large Empire Revival mahogany and ormolu mounted circular jardiniere. With a brass lining, that was recently made to its exact specifications. The main body has 4 panels, with 2 large well cast lifting handles with acanthus leaves to the side and a carved cast flower head to the back plate, with a central drop section. This is held in the fielded panel with fine ormolu beading in a stylish pattern, and continues across the piece. The 2 panels without lifting handles have a large motif of flowers, and flowering fruit. Between each of the panels there is a cast upright in the form of a vase with swags and tails falling from the top down. The jardiniere stands on 4 legs, each of them in the form of a winged lion on a podium with a cast head, wings and mahogany body. It is shaped and curved and standing on a stylish animalistic foot. There is an inventory number on one of the facings ‘X954’. The jardiniere liner is removable and is water tight so can be used for flowers or as a wine cooler. Provenance: Kinloch Castle, Isle of Rum, Scottish Highlands. The castle was built in 1900 by George Bullough, and as well as being the first private house in Scotland to have electricity, no expense was spared during construction or decoration. 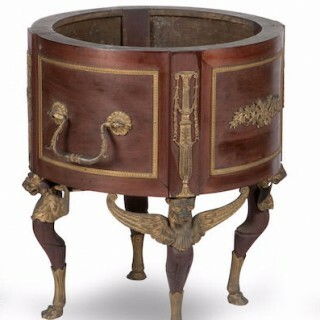 This jardiniere was part of the original furnishing in the Empire Room. 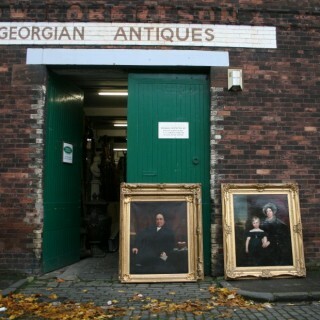 Excellent condition, with newly fitted brass interior. Inventory number next to one of the legs.